....it's a feature (at least for certain specific definitions of 'feature'). We should all be thankful we don't get all the government we pay for: any agency this incompetent/obstinate shouldn't be much of a threat to anyone. Since the CIA has been creating its own off the books funding through cocaine and other distributions, no we aren't even getting a government that we pay for.... directly. Muckrock generally abuses the FOIA process vt making tons of neat nonsense requests attempting to trip up the system. They appear to be one of the reasons that the system doesn't work for the rest of us. "Which is worse? The casual admittance that they haven't done anything for over half a decade, or the unfathomable audacity of putting Smathers on deadline?" Neither. The fact that they haven't done anything for 6 years is bad, but their admittance of this is actually very good. It means that wherever he is in the backlog is getting some attention and will get some effort to process. It also means they're admitting a problem rather than trying to sweep it under the rug. As for the rest, it's basic admin work. Someone's going through a backlog and is checking that the requests are still required. Given that a positive response is required to confirm that this is true, it makes sense to put a time limit on the response. It's likely that this time limit will actually enable Smathers to get his request processed sooner. Also, I'm not sure how this works, but has he been chasing the request at any point over that 6 years (assuming that's possible), or has he just been leaving it until they bothered to contact him? So, it's bad that it's taken this long, but freaking out over standard admin work that shows people are finally getting to that point in the backlog is counterproductive. Wait, so you feel like there is nothing wrong with their statement that since there has been no correspondence in six years, which is COMPLETELY AND TOTALLY THEIR SCREW UP (not the requestor's), they are going to close out the case if the requestor doesn't speak up? How about an apology instead? "We're sorry completely ignored you for six years. Are you still interested in the data you requested?" "Wait, so you feel like there is nothing wrong with their statement that since there has been no correspondence in six years, which is COMPLETELY AND TOTALLY THEIR SCREW UP (not the requestor's), they are going to close out the case if the requestor doesn't speak up?" No, I don't. An apology would be nice, but this is a simple mailing to make sure that open requests are still required. It's highly doubtful this is the only person to receive such a letter, so it's silly to take it personally. Once the time limit's been reached, it's reasonable to presume that either the request is no longer required or the recipient is no longer contactable via the given address (and so won't be able to read the eventual response). Therefore, they can clear some backlog quickly and reserve time & resources for the people who still need a response. In other words, the point of the letter and time limit is to speed things up for the people who do reply with a request to keep their original request open. The alternative would be to continue at the snail's pace they have been going at, much of that effort wasted on people who no longer require the information. The tone could be nicer, but getting offended over a standard admin technique is extremely silly. "In response, the agency sent him partially redacted copies of those same two rejections. " Due to my browser configurations the frame right after that phrase is completely blank unless I take action, which made me giggle a little because even before checking anything I already knew a blank frame has the same impact/utility the partially redacted document probably had. 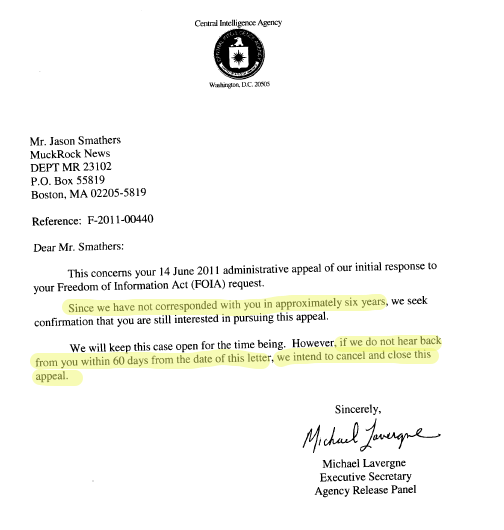 Under what legal statute do they have the authority to not respond to a FOIA request and then inform the requester that based on the agency's own non-performance, the requester has 60 days to reply so that the agency can continue to not fulfill its legal obligation? This should be evidence in the termination proceedings of some government employee. Having spent some time in government, this is not even surprising. Trump could fix this on day ONE.